Reviewers say gas cooktops excel at temperature control, and many owners like the ability to adjust the gas flame by sight. However, experts say gas cooktops aren't as good as electric cooktops, which we cover elsewhere in this report, at maintaining consistent cooking temperatures, particularly at high and low heat settings. Most gas cooktops are 36 inches wide, but many 30-inch models are also available. Some manufacturers also make professional-style cooktops that measure up to 48 inches wide. While we'd be happier if user feedback were more extensive, what's available is glowing when it comes to the 36-inch Samsung NA36K7750TG/AA (Est. $1,700). It's also the top-rated 36-inch gas cooktop at Consumer Reports, easily outpacing the pricier, and former top-rated model there, the Thermador Masterpiece SGSX365FS (covered below). Performance is stellar, users and experts say. Consumer Reports rates low heat performance as Excellent, and high heat performance as Very Good, and no gas cooktop it tests does any better on either score. 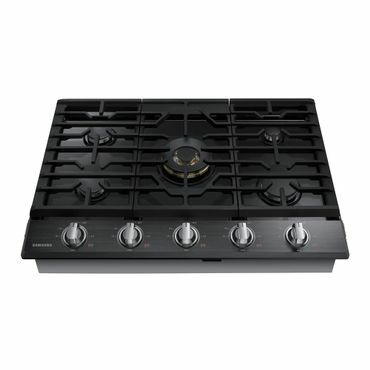 Its complement of five burners includes a high-power dual center burner capable of either putting out 22,000 BTU of heat for bring things to a boil in a flash, or of dialing things down to a precise simmer. The other burners range from 5,500 BTU to 13,000 BTU to handle a wide variety of cooking tasks. The oven also ships with a cast iron griddle with stainless-steel handles and a wok grate for tip-free stir-frying. But the headline extra is Wi-Fi and Bluetooth connectivity. The former lets you pair the cooktop with a smartphone app that lets you monitor the cooktop remotely, and includes a timer to remind you when cooking is done. The latter lets you sync the cooktop with a compatible Samsung hood, so that it turns on its fan and lights whenever the cooktop is on. As we noted, user feedback isn't all that plentiful, but we saw around two dozen reviews at Best Buy, were it earns a 4.8 star rating and recommendations from all that own this cooktop thus far. There are fewer reviews at Home Depot, and a couple of complaints, but those are over customer service issues and challenges getting Wi-Fi to work rather than the cooktop's performance. The Samsung NA36K7750TG/AA comes in black stainless. It's also available in standard stainless as the Samsung NA36K7750TS (Est. $1,500). If a 36-inch cooktop is too large for your kitchen, these cooktops are available in 30-inch widths as the Samsung NA30K7750TG/AA (Est. $1,600) in black stainless, and in regular stainless as the Samsung NA30K7750TS/AA (Est. $1,500). Expert and user feedback are every bit as glowing as for the 36-inch versions. It's a little pricier than the Samsung, but the Thermador Masterpiece SGSX365FS (Est. $1,900) is also very much worth considering. It's the second highest rated gas cooktop at Consumer Reports, and earns identical ratings for cooking at low and high heat as the Samsung. At Reviewed, which hasn't rated the Samsung, the Thermador cooktop earns both Best of Year and Editors' Choice awards as well as a perfect 10 score. Ethan Wolff-Mann notes that, "Our lab tests showed that this cooktop's reputation is well-deserved, with some of the best performance we've recorded from gas burners." Styling is gorgeous. Reviewers praise this 36-inch stainless steel cooktop's continuous cast-iron grates, which allow them to slide a pot from burner to burner without lifting. Its five sealed burners -- ranging in power from 9,100 to 18,000 BTUs -- have a distinctive star shape, which Thermador claims provides better heat distribution without cold spots. Reviewers also praise the 200-BTU "ExtraLow" setting, which cycles on and off to maintain a precise temperature for simmering. Other features include single-point ignition (which delivers a spark only to the burner being lit, rather than to all burners at once) and automatic re-ignition, which turns the flame back on if it is accidentally blown out. As is the case with the Samsung, though, owner reviews are hard to come buy -- not surprising considering this cooktop's price tag. What's available from authorized sellers is highly positive, but no site has more than a handful, and that gives us a little pause. Based on that, plus its lower price (and sometimes much lower as the Samsung is more likely to be found on sale -- at the time of our review, we spotted the black stainless version at less than $1,400, and the stainless steel one at less than $1,300), we tip the scale in our recommendations toward the Samsung, but if your sense of style demands it, and your pocketbook allows it, you also can't go wrong with the Thermador SGSX365FS. Not everyone has room in their budget for a gas cooktop that costs $1,000 or more. If you need something that won't completely empty your wallet, it's tough to go wrong with the 36-inch Maytag MGC9536DS (Est. $950). It's the only gas cooktop we spotted that earns a recommendation from an expert reviewer -- Consumer Reports -- and is priced under $1,000 (and often a bit less when found on sale). It performs identically to the pricier cooktops above when it comes to high heat performance, but is a step behind (but still Very Good) when it comes to tasks such as melting chocolate or simmering tomato sauce. Users are impressed as well, and while the number of reviews isn't overwhelming, we saw enough for that feedback to be meaningful. The Maytag MGC9536DS is offered in stainless steel and features five burners ranging in power from 5,000 BTU to 18,000 BTU. It has a continuous grate design, and those cast iron grates are dishwasher safe. The cooktop has a Duraguard finish that's said to make it easy to keep things clean. Whether or not that's why, most users (but not all) say that cleaning the cooktop is a breeze. One plus, unlike some gas cooktops and ranges, the gas burners can be lit manually if the power is out. Another plus, is that the cooktop is made in the U.S. If you needs something even less expensive, consider the Whirlpool WCG51US6DS (Est. $800). It's not been reviewed by any credible experts that we spotted, but it gets good ratings from users. This 36-inch model comes in stainless steel, but is also available in black as the Whirlpool WCG51US6DB (Est. $700). In spite of its low price (and lower still if you find it on sale, which is common) owners say that the Whirlpool WCG51US6DS is a stylish-looking upgrade in their kitchen. It features a continuous grate design with five burners; a 15000-BTU SpeedHeat burner, a 12000-BTU burner, two 9100-BTU burners, and a 5000-BTU simmer burner. It doesn't fall behind in other areas either, and we saw a number of comments about how easy this gas cooktop is to install and to keep clean. Many say they are "in awe" of how well it performs, especially considering the very low price compared to most other gas cooktops.